New details emerging from the analysis of data from North Korea's April 5 Taepo-Dong-2 test indicate the vehicle flew successfully several hundred miles further than previously believed and used more advanced steering than has been demonstrated by the North Korean's before. The rocket impacted as far as 2,390 miles from the launch site as opposed to about 1,900 miles as earlier announced by the U. S. and Japan. Smoke puffs from the side of the vehicle at the moment of liftoff and after, indicate the rocket could have been equipped with attitude control thrusters. It also temporarily flew in space before failing and dropping back into the atmosphere at relatively slow speed that enabled debris to survive till impact rather than burning up. The updated analysis indicates the failure occurred when the solid propellant third stage of the vehicle failed to separate properly after the second stage fired normally. After burnout the second stage coasted upward into space where the third stage was supposed to separate and fire, but did not. Earlier it was believed that the second stage had failed early in its burn. The rocket also demonstrated more advanced steering and other advances that could enhance its deployment as a silo-based ballistic missile. The Japanese Ministry of Defense and U.S. Defense Dept. now believe that the second stage of the rocket performed as planned rather than failing early in its flight phase. The new information comes from updated radar tracking calculations and possibly also U.S. Air Force Defense Support Program (DSP) missile warning satellite data. The bottom line is that the North Korean vehicle flew as much as 500 miles further over the Pacific toward Hawaii than U.S. and Japanese forces had announced initially. The new data now indicates that the second stage fell in the impact zone the North Koreans had earlier warned shipping and aircraft away from, instead of falling short of that zone as earlier indicated by the U.S. and Japan. The vehicle's second stage uses a Scud-ER (extended range) rocket engine that employs "step-throttling" in its propulsion to stretch the second stage burn duration to gain range and velocity. For the April 5 space launch mission the second stage was to use the same step-throttling technique, according to Charles Vick of Global Security.org. In years past Vick has provided accurate and detailed rocket analysis data to varied users, including the Congressional Research Service. The rocket performance data indicate that during the April 5 flight, the second stage did ignite after separation from the first stage, says Vick. The vehicle was flying in space at this time above 50 miles altitude, just above the outer fringes of Earth's atmosphere. Earlier data indicated that the failure occurred during this throttle-down sequence to as low as 65 percent thrust. But the new data shows the second stage performed this critical activity as planned, Vick told Spaceflight Now. The updated impact point was calculated from U.S. sensor data as the vehicle flew out of range of Japanese radars about 1,000 miles east of Japan. 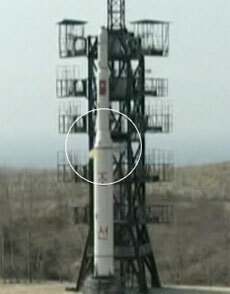 Details visible in the North Korean state television video of launch have also been analyzed further, turning up at least two major news issues on vehicle guidance and design. This was not observed during the first Taepo-Dong-2 launch in 1998 and could indicate much more advanced steering capability than the rocket nozzle steering vane system used in the much more crude Scud launcher. The puffs jet from the side of the vehicle at where the second and third stages meet. The most visible puffs occur a split second before ignition (see picture above) and then again at liftoff. A Japanese enhancement of the video indicates that the puffs continue as the vehicle climbs out and pitches over to accelerate, says Vick. There are also indications in the video that the North Koreans added a structural covering over the entire third stage of the rocket once it was on the pad to form a constant volume outer diameter between the upper stage and the payload shroud. Earlier DigitalGlobe WorldView 1 commercial satellite imagery of the vehicle when it first arrived on the pad showed a more narrow upper stage with a bulbous payload shroud. The liftoff views of the vehicle show a constant outer diameter. Japanese enhancement of the imagery show the same changes, Vick said. Why the North Koreans would want to place an extra fuselage covering over the third stage could relate to vehicle aerodynamics or flight temperature extremes the upper stage may experience. But it would be much easier to install such a fairing before erection on the pad unless there were access ports to the satellite payload or upper stage used during pad processing that needed to remain open for access during early processing.